Phytoplankton is responsible for about half of the total amount of oxygen produced by all plant life. That would make a 1% yearly reduction of phytoplankton a really negative outcome of global warming, don't you think? I can just picture how the majority of the world's mammals will suffocate in the next one hundred or two hundred years, and how only a fraction of all humans will survive by artificially produced oxygen. Oceanic regions use to estimate phytoplankton abundance. 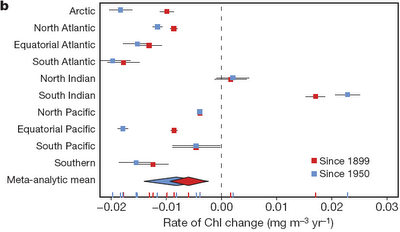 Rates of phytoplankton biomass change, measured by total chlorophyll pigment concentration (‘Chl’). 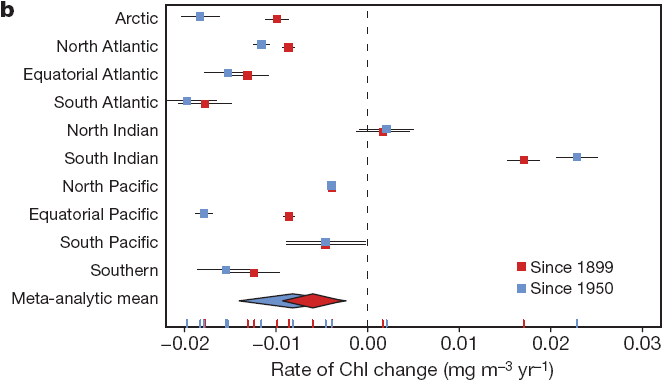 These results provide a larger context for recently observed declines in remotely sensed Chl, and are consistent with the hypothesis that increasing ocean warming is contributing to a restructuring of marine ecosystems, with implications for biogeochemical cycling, fishery yields and ocean circulation. Oh crap. We are in bad trouble. This is the stuff I try not to think too hard about, because it's scary. denies the scientific validity of climate change. It makes me want to throw tantrums, except no one would care! This is very depressing and scary. Im finding it hard to breathe. I stumbled on this research (phytoplankton decline) a few days ago. I was horrified because I realized the implications - half the atmospheric oxygen on earth gone within a few more decades, the equivalent of being at 20,000 feet altitude today. Only a tiny fraction of very fit people can survive at 20,000 feet without oxygen today. The same goes for most animal and bird life. When sea-level oxygen declines to that level, human and animal life will die off at a rate too horrific to contemplate, planet-wide. The media, bless their hearts, have largely ignored the scariest science story I've heard in my lifetime. Maybe it's for the best - this is almost certainly irreversible and inevitable, and the incredibly rapid pace of the approaching catastrophe will leave us with virtually no time to hunt for survival strategies. yes, you're all right. I don't know what to say, and I don't know what to think. We may indeed really be seriously doomed. Even if many humans can survive on, surely most other mammals and all sorts of other animals (plants, too?) will go extinct. Coral reefs and rain forests disappearing is bad enough, but this plankton catastrophe makes them pale in comparison. "A complete recovery from each of the five major extinctions required tens of millions of years. In particular the Ordovician dip needed 25my, the Devonian 30my, the Permian and Triassic (combined because they were so close together in time) 100my, and the Cretaceous 20 million years. These figures should give pause to anyone who believes that what Homo sapiens destroys, Nature will redeem. Maybe so, but not within any length of time that has meaning for contemporary humanity."